The Berries are traditionally used as antiviral agents for colds, influenza and Herpes Virus infections. Used for thousands of years by the Native Americans and Mediterranean people of the basin and surrounding areas. The berries continue to be gathered to this day usually for food and medicine. Flowers and berries are still gathered throughout the English countryside to flavour cordials, drinks and preserves. 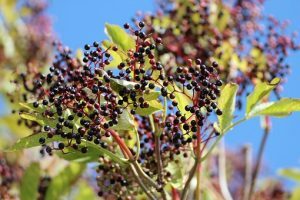 However now, clinical research shows us that the Elderberries can reduce flu-like symptoms, including antiviral and immune-modulating, antioxidant effects. They also include insulin stimulating properties. Contraindications: Always use a trusted source of Elderberries as the unripe fruit can be toxic when ingested. AS there is no safety data regarding Elderberry being taken during pregnancy it is best to avoid.